The spot resin markets continued to transact at a rapid rate, pushing monthly volumes to a new high for the year. While done deals were again heavily weighted in favor of Polyethylene over Polypropylene, PP was much better represented than in the previous week. Spot PE prices were steady to a penny lower while PP lost a cent. PE contracts rolled flat in Oct, so processors have flocked to the spot market for relative deals as plenty of material is available at well-discounted prices. Producers will try to prop up contracts again in Nov as increases remain on the table, so feel free to reach out to our trading desk as special spot opportunities abound. PP contracts were also flat in Oct and are poised to decline sharply in Nov as feedstock costs tumble further. The PE export market remains strong, though not necessarily through traditional channels; still, near record volumes of PE are finding homes offshore as producer direct sales flourish. The major energy markets all ended in negative territory and the sharp selloff in US equities contributed to the poor performance. Volatility remained high in the Oil complex as looming Iran oil sanctions have been countered by a recent string of inventory builds. WTI Crude Oil scored small gains in 4 of the 5 trading days, but it was not enough to overcome the nearly $3/bbl loss on Tuesday. Although prices rebounded, the Dec futures contract ended down a net $1.69/bbl to $67.59/bbl. Brent Oil fell a tad more, dropping $2.16/bbl to $77.62/bbl. Dec Nat Gas futures traded on both sides of even money but ultimately gave back $.084/mmBtu to $3.225/mmBtu. NGL prices eroded for the 4th straight week. Ethane began October at $.54/gal and the Nov contract chunked off a huge $.07/gal, almost 20%, this week to settle Friday at $.32/gal ($.135/lb). Propane also sustained a large decline, falling as low as $.82/gal before recovering to almost $.86/gal ($.24/lb), still a sharp $.11/gal loss. Monomer trading was active with solid volumes seen throughout the week, as participants apparently came ready to transact. The Ethylene market found modest support early in the week and etched a penny gain, while retaking the $.19/lb level. Prices then flattened out, moving in a tight range around $.19/lb where multiple deals were finalized. A several cent premium for Ethylene in Louisiana has developed where prices are around $.22/lb. PGP prices continued to peel off, sliding slightly on Monday and then falling throughout the week. 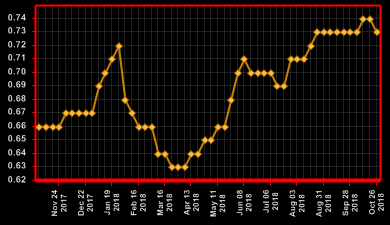 November became the main focus and drilled down to $.50/lb, it was a huge nickel loss for the week. Since October rolled flat at $.60/lb, which was quite generous, Nov PGP contracts are now set up for a sizable decrease, perhaps as much as $.07-.08/lb, but there is still time before negotiations begin. The spot Polyethylene market transacted at an intense pace throughout October and this past week did not disappoint. There was very good demand for most major commodity grade resins including LDPE Film, LLDPE Film and Injection as well as HDPE Injection, which has become fairly scarce. While spot Polyethylene has been on a steady decline since March, down more than a dime on average with variance by grade, the overall contract market, despite some fluctuations and confusion, has been relatively flat to down just $.03/lb. When spot decreases and contracts hold, it is common for those buyers who have some flexibility to shift some of their purchases to spot where they can procure incremental pounds at lower levels. This disconnect is part of the reason why our spot market has been so active these past months. 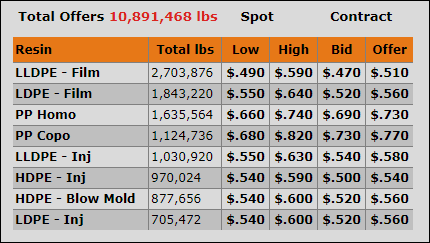 Our spot PE prices were steady to down another $.005 - .01/lb this week and a few grades such as LD Film, LD and LL Injection are at yearly lows while the others are hovering nearby. The market seemed to have been rebounding a bit mid-month as low end spot offers cleaned up; however, the market sputtered and the lack of momentum / follow through contributed to PE contracts rolling flat for Oct. 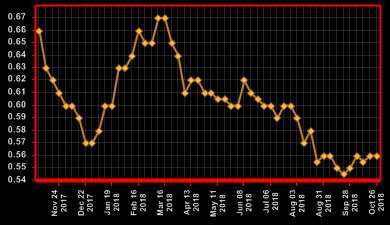 The average $.03/lb hike will be pushed to November, but the increase will likely struggle until spot and contracts close much of their gap - which is still widening. Spot Polypropylene trading was much improved; although supplies remain relatively tight, slightly softer spot prices helped transactions to complete. PP prices gave back a penny as PGP monomer trickled lower throughout the week and now points to a meaningful contract decrease come November. We saw good resin demand from both resellers and small / large processors and interest was centered around CoPP, both high flow and no break. HoPP demand was scattered, with just a handful of high flow deals done. Despite some weakness, Polypropylene supply is still spotty and not easily sourced at interesting prices. With PGP monomer costs coming off perhaps availability will pick up a tad as suppliers seek to limit uncommitted inventories.